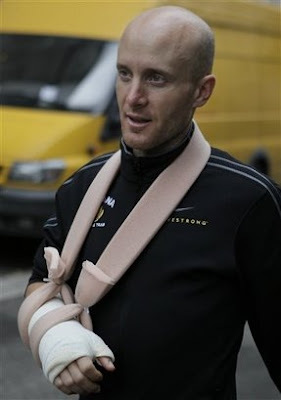 In other big news, two prominent persons broke their wrists in the world this week. One came out of plain overuse, as this picture, this picture, this picture and this picture suggests. Isn't it said, "Thou shalt not use that arm in vain"? But another one's ordeal ended in rightful emotion. It seems teams are not just limiting the yellow color to kits, bikes and urine bottles. Yellow food. For God's sake, when will this stop? The other headlines to grace the pages of the Web is something I get a kick out of. 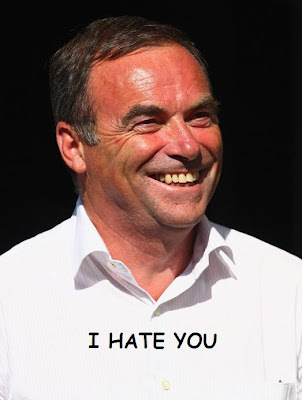 So Hinault says Armstrong will win this year's Tour, not.... The Frenchman, who was once a badger, also says he doesn't give a badger's bottom about Armstrong, adding "There’s also the language barrier, so we’ve never been able to speak man to man." I thought Armstrong was fluent in French? LOL. Upon closer observation, it seems it's Mr. Hinault who is at fault because he got the Crest toothpaste's punchline all wrong. Funny stuff man! Thanks for the laughs. Really looking forward to Stage 15 tomorrow! LOl,its not about me for sure. Its about Contador. Bet he's going to drop Armstrong like a sack of sh*t tomorrow. I think I'll be in yellow tomorrow. I'm going for a sufferfest ride in the morning.